After an early unwrapping (I believe we were the first in our marina), the boat projects began in earnest (who is Earnest?) in April. 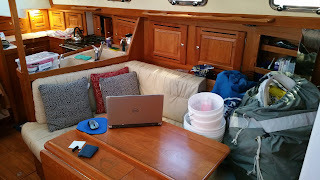 We finished up the Sat/Com Installation and a few other things. The biggest hump to get over however is some major work to be done in Barrington, RI at Stanley's Boatyard. Isn't that a new boat? Well, yes but "new" does not necessarily mean "ready for offshore". Although we are not doing the Newport-Bermuda Race, we have made an effort to adhere to most of the safety requirements for that race. 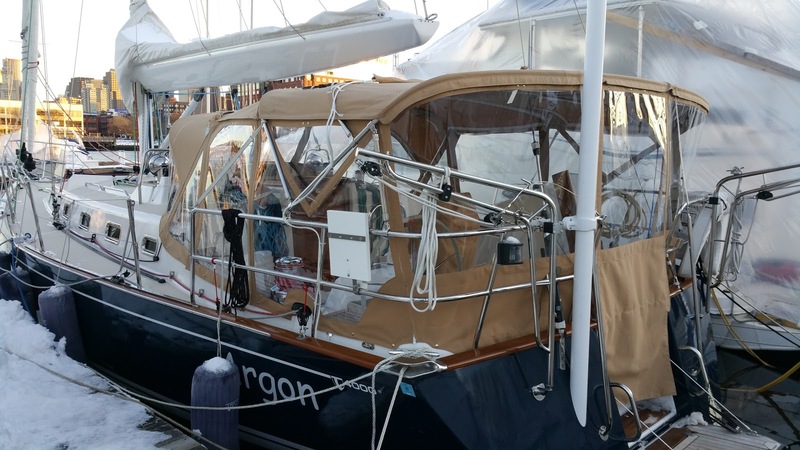 There are also some common sense things that needed to be addressed in order to transform Argon from a coastal cruiser to the offshore monster she needs to be. 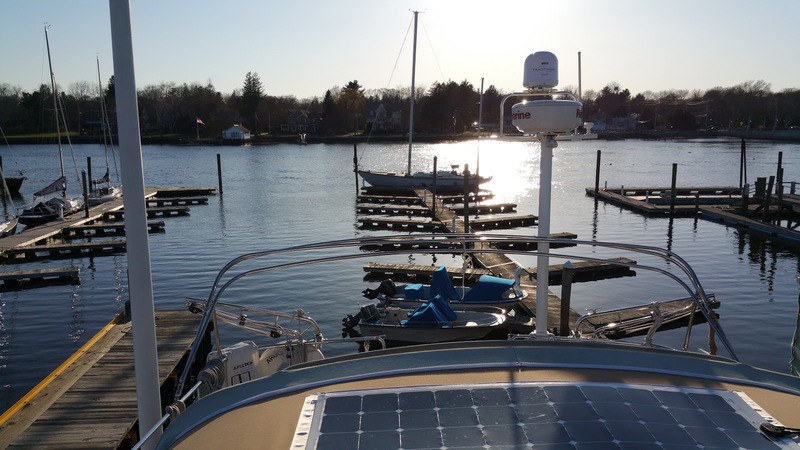 Boat manufacturers install Manual Bilge Pumps on their boats. This pump allows them to check a box saying that it has one. In reality, they are absolutely useless. Here is a video that we made last year testing how fast we could empty our bilge in an emergency with this toy. The solution is to put a REAL bilge pump in. We chose an Edson 18gpm bronze diaphragm pump. This is one thing we wish we thought of when Argon was being built. Would have been so much simpler and cheaper to do it then. This is something we hope we never need to use. We talked to North Sails about building us a storm sail. 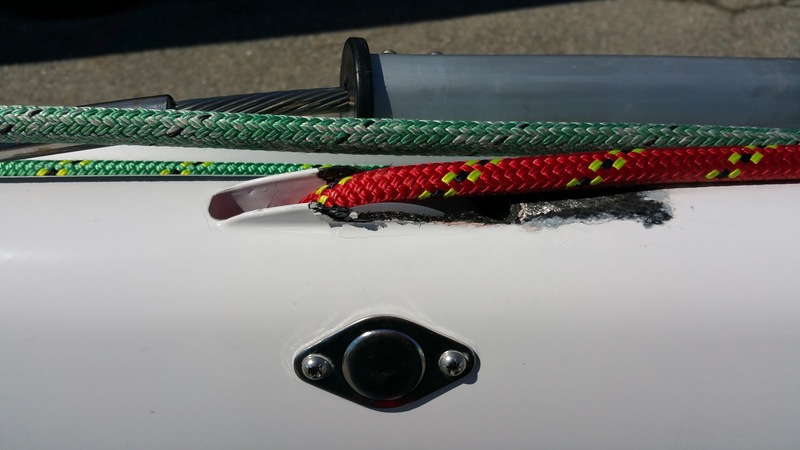 This is needed if/when conditions deteriorate to hitting-the-fan levels and the goal is just to keep the boat safe. 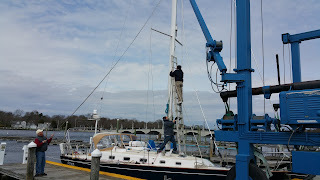 It requires that a second track be installed on the mast. 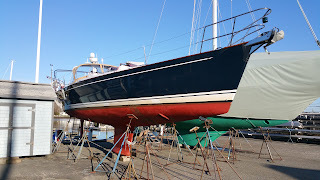 This work is being done at Hall Spars and Rigging in Bristol, RI. North delivered our new storm sail in April and I was very happy to see how small and light it was. This is something we hope to never use. 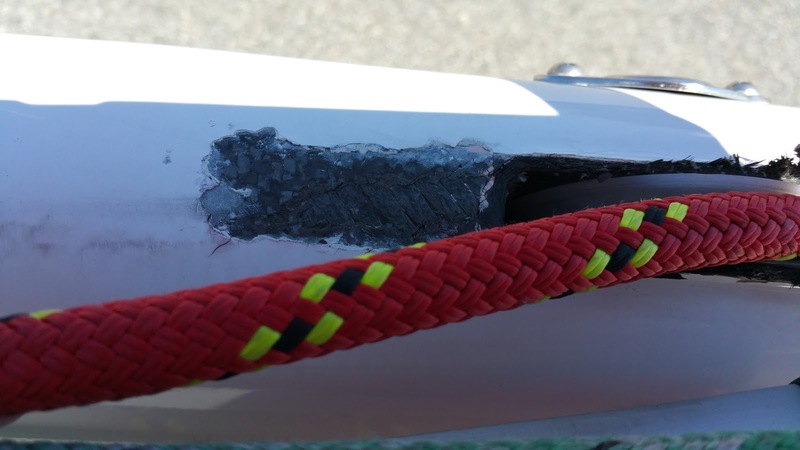 One of the safety requirement for offshore races is that keel-stepped boats have a means of securing the mast DOWN to the step. 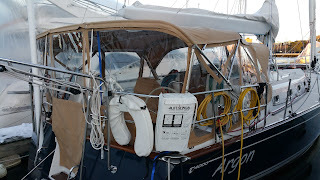 This is in case the boat gets dismasted. 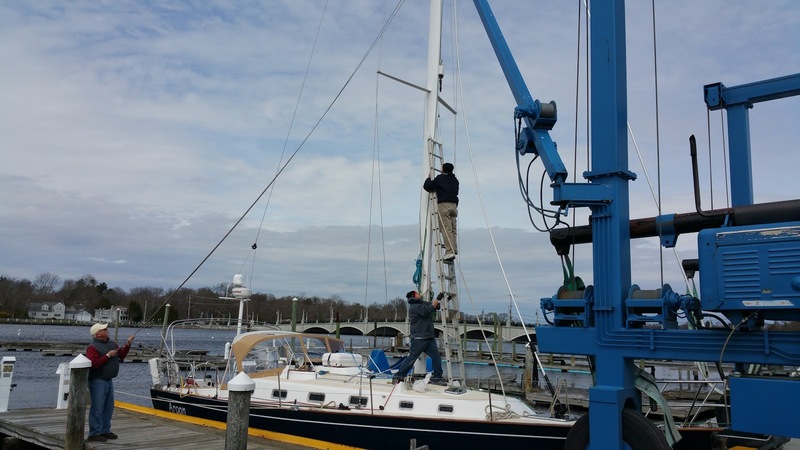 In this situation, if there is a significant amount of the mast left above the deck unsecured, it can hop off of the step and do serious damage to the boat (or anyone unlucky enough to be below when it happens). 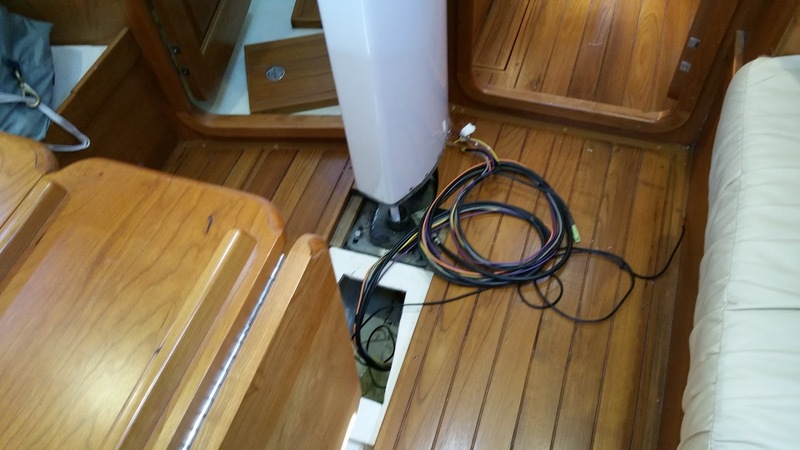 The solution is to install a simple pad-eye and a short cable to tie the mast down to the step. This is something we hope to never use. While the mast was down (ie: not requiring any climbing), I replaced the festoon bulb in our steaming light with an LED version. 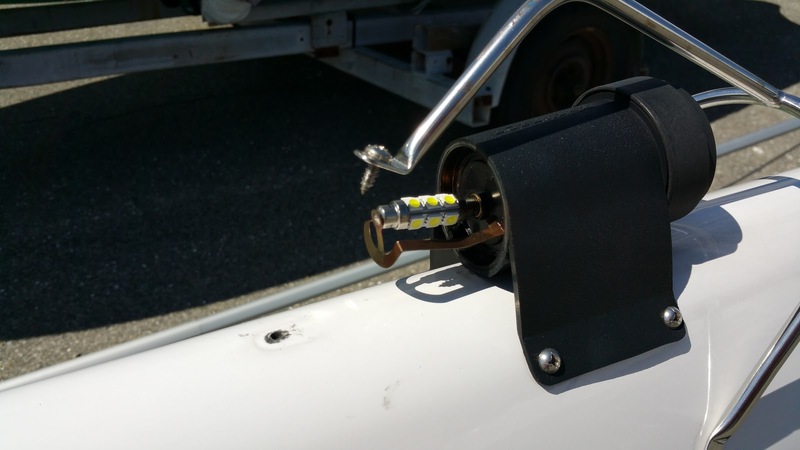 We are also replacing the halogen anchor light with a combination Anchor/Tri-color nav light - All LED of course. This requires Hall Spars to run an additional wire up the mast. Things got a little behind schedule from the start. just as they got the crane in position to pull the stick, the winds came up to gusts in the 20s. "This isn't happening!" and the mission was aborted for that day - and the next as winds were even higher the next day. Finally, on the third day at SBY, we had some very low winds. 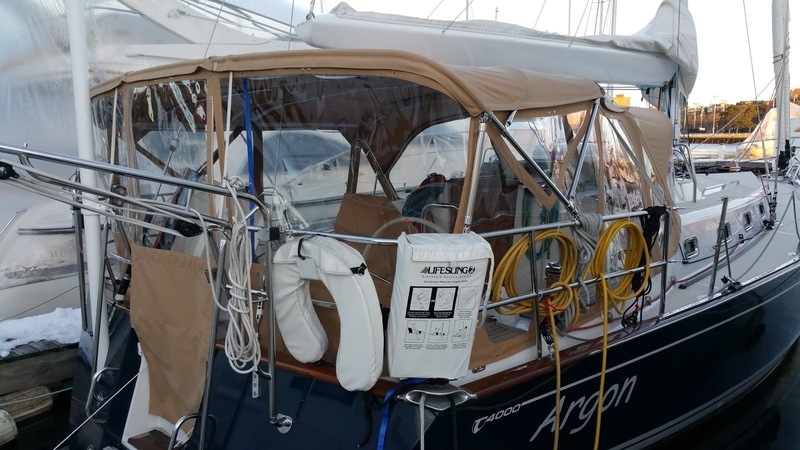 Our mast is sealed in the deck partners with a product called Spar-tite. 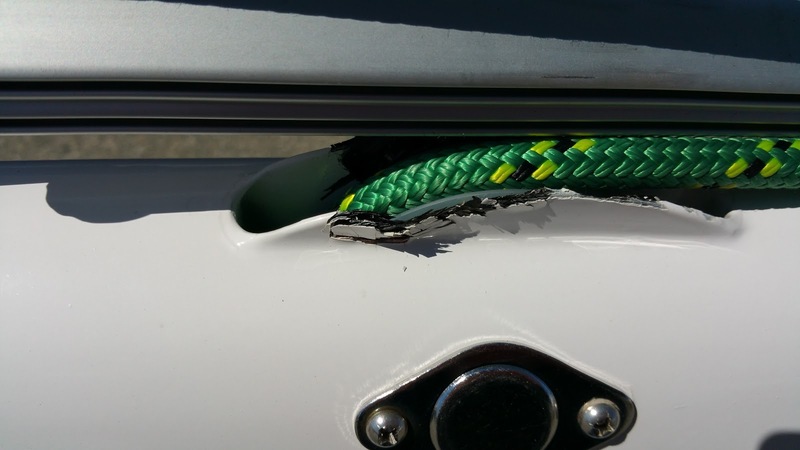 It's an epoxy filler that forms a perfect shape to the deck collar and really keeps out the water. SBY was stressing a bit about this because sometimes, these masts just do not want to pop out. Bill Shaw and I did the spar-tite in 2014 when she was commissioned and we tried to do a good job including the waxing of the inside of the collar. Apparently we passed the test as the stick popped out with no effort at all (well no effort for the crane at SBY anyway). While the mast was laying on the saw horses in the yard, I noticed some not so nice looking wear to the carbon fiber around the sheaves for the jib and genoa halyards. After some consulting with Tartan and Hall, we have a plan to address this. Hopefully, it will not cause any significant delay in getting back in the water. Once again, I enlisted the help of my buddy Greg from s/v Piao as crew with me to get Argon to Rhode Island. We left about 0700 on Friday April 8th into a pretty strong wsw breeze. The forecast was for this breeze to be strong but to clock around more to the north. 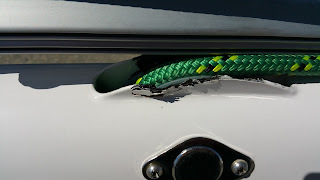 We were looking forward to a nice fast sail down - and it started out that way. But, by "to the north", they really meant "to the south" and soon we had mid 30s wind coming around on our nose. It was pretty nasty for a while. I was cranky and miserable. Greg was having a blast! We finally after a few very wasteful tacks, gave up and motored at around Plymouth and made very slow time going head-on into this wind and waves. We ended up being late for the canal - like very late. The normal 45 minute transit took more than 3 hours in fact! It was also a really cold day. This trip would have been all the more miserable were it not for the fact that Kinder Industries had just finished up the side curtains for the cockpit. We had a fully enclosed cockpit for this trip - and it was awesome! We made it to Mattapoisette at about 2300 and anchored for the night. The next day we started at 0700 and motored the rest of the way in about 4kt of wind. I hate motoring, but compared to the previous day, this was a nice change. As Linda and I labored to remove all the canvas and sails at SBY on Sunday, she said "So... it was really worth putting all the sails on just so you guys could sail 1/3 of the way here?" 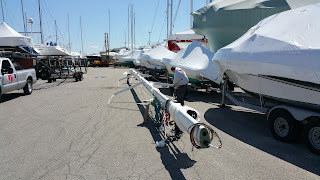 "Yes it was"
Argon is hauled and the mast is at Hall Spars. Aside from the little surprise with the sheave boxes on the mast, there is nothing out of the ordinary. SBY has said it's ok for me to stay aboard even when up on the jack stands. Linda smartly planned a work trip to the UK during this time. We're trying to minimize the life disruption while this work goes on. 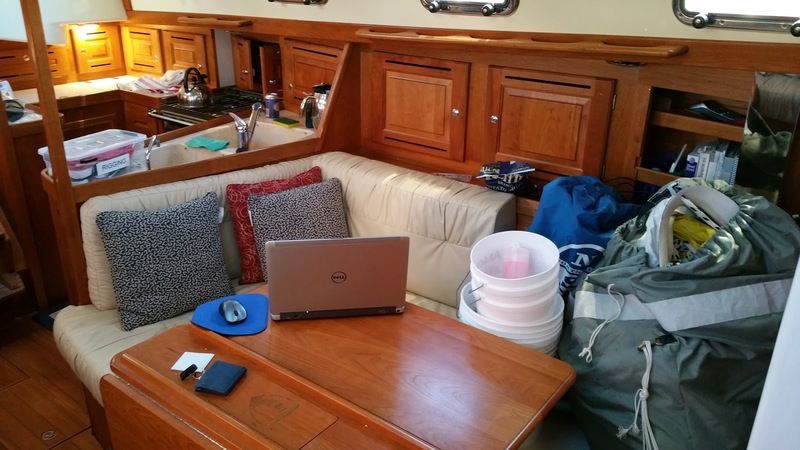 Everything we own is on that boat so it's a bit inconvenient.